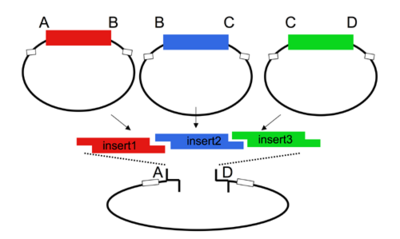 The Lim standard is based on a multi-part/combinatorial cloning technique that is particularly well suited to shuffling protein domains. The key to this approach is the Type IIS restriction enzyme, AarI, a rare (7-cutter) that cuts 4bp offset from its binding site. Thus, AarI can generate four base overhangs of any sequence. Since the user can specify the overhangs, this method can be used to "stitch-together" fragments without a scar, which is sometimes necessary to preserve protein function. More importantly, these overhangs can be non-palindromic thereby avoiding a key problem of trying to do multipart ligations using standard restriction enzymes: the self ligation of a part (which blocks proper assembly of parts). The Lim standard enables high efficiency ligations of up to 4 parts simultaneously (vector plus 3 inserts). While parts can be made with any 4 base overhangs, we chose a standard set, termed A, B, C, and D to facilitate exchange of parts between researchers. Note that most parts that adhere to the Lim standard are primarily intended for use when working with yeast. Or get help on Assembly standard 28 parts. the BioBrick part, device or system that is located in the cloning site, between (and excluding) the Assembly standard 28 prefix and suffix. While any vector can be adapted to adhere to the Lim standard, most of the available vectors from the Registry that adhere to the Lim standard are derived from the yeast pRS__ series of vectors. The Registry has several types of acceptor vectors built in the pRS315 or 305 backbone. When necessary, markers can be exchanged by one-piece subclones of the completed cassettes into alternative pRS vectors, using the Kpn1/PspOMI and SacI sites. In the Registry, protein coding sequences begin with a start codon (usually ATG) and end with a stop codon (usually with a double stop codon TAA TAA). Protein coding sequences are often abbreviated with the acronym CDS. The N-terminal domain of a protein coding sequence is special in a number of ways. First, it always contains a start codon, spaced at an appropriate distance from a ribosomal binding site. Second, many coding regions have special features at the N terminus, such as protein export tags and lipoprotein cleavage and attachment tags. These occur at the beginning of a coding region, and therefore are termed Head domains. A protein domain is a sequence of amino acids which fold relatively independently and which are evolutionarily shuffled as a unit among different protein coding regions. The DNA sequence of such domains must maintain in-frame translation, and thus is a multiple of three bases. 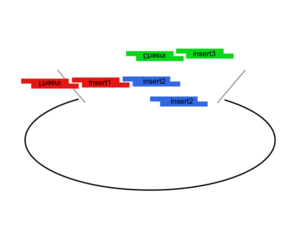 Since these protein domains are within a protein coding sequence, they are called Internal domains. Certain Internal domains have particular functions in protein cleavage or splicing and are termed Special Internal domains. Similarly, the C-terminal domain of a protein is special, containing at least a stop codon. Other special features, such as degradation tags, are also required to be at the extreme C-terminus. Again, these domains cannot function when internal to a coding region, and are termed Tail domains. For more details on protein domains including how to assemble protein domains into protein coding sequences, please see Protein domains. Lim Sergio G. Peisajovich, Andrew Horwitz, Oliver Hoeller, Benjamin Rhau & Wendell Lim. BBF RFC 28: A method for combinatorial multi-part assembly based on the Type IIs restriction enzyme AarI. BBF RFC 28. doi:1721.1/46721. DSpace.